I was asked to make some decorations for a shower recently and ever the one to over commit to things I said yes. I had to relearn how to make paper pom poms in the process. Since this project wasn’t for me I didn’t want to go cheap or go quick, I really wanted to figure out what paper pom pom method yielded the best looking decorations. So I picked up a few different materials and got to work. By the time I was done I had enough DIY decorations for twelve showers. 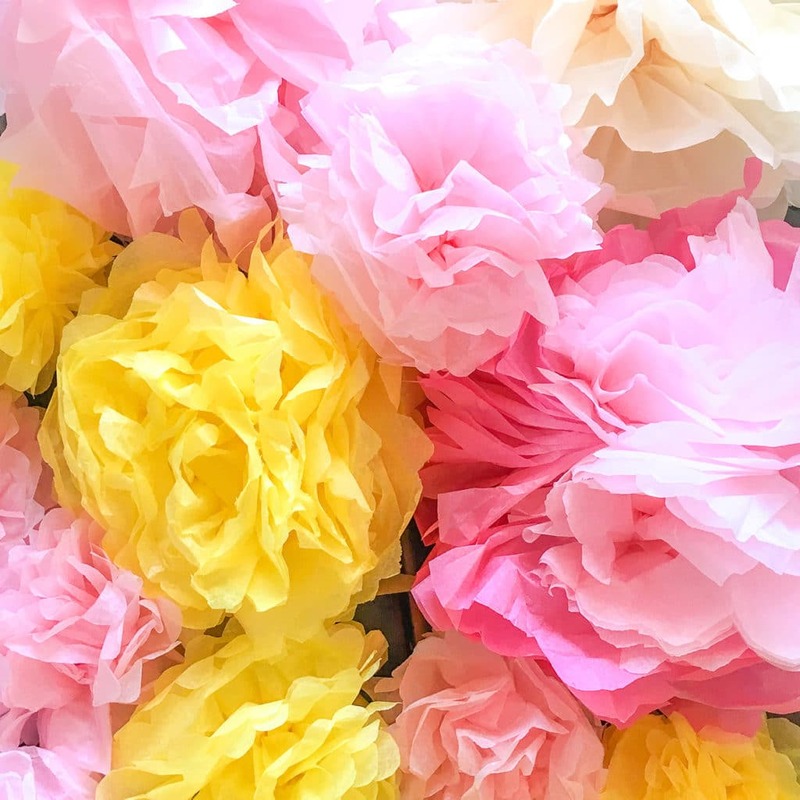 But….I also picked up a few tips and tricks to make these paper pom poms full, fluffy and beautiful and I thought I would share those with you. 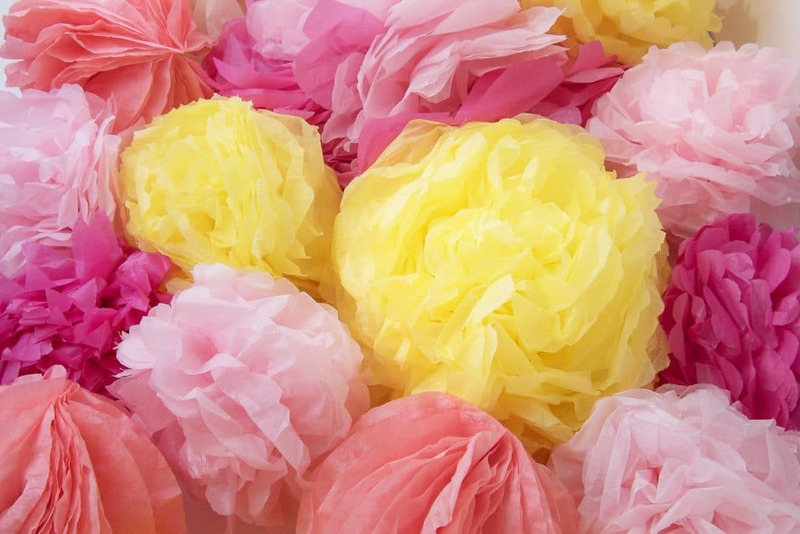 I made the traditional tissue paper pom poms, which I think were the best looking, they most resembled flowers and had the best fluffy layered look. 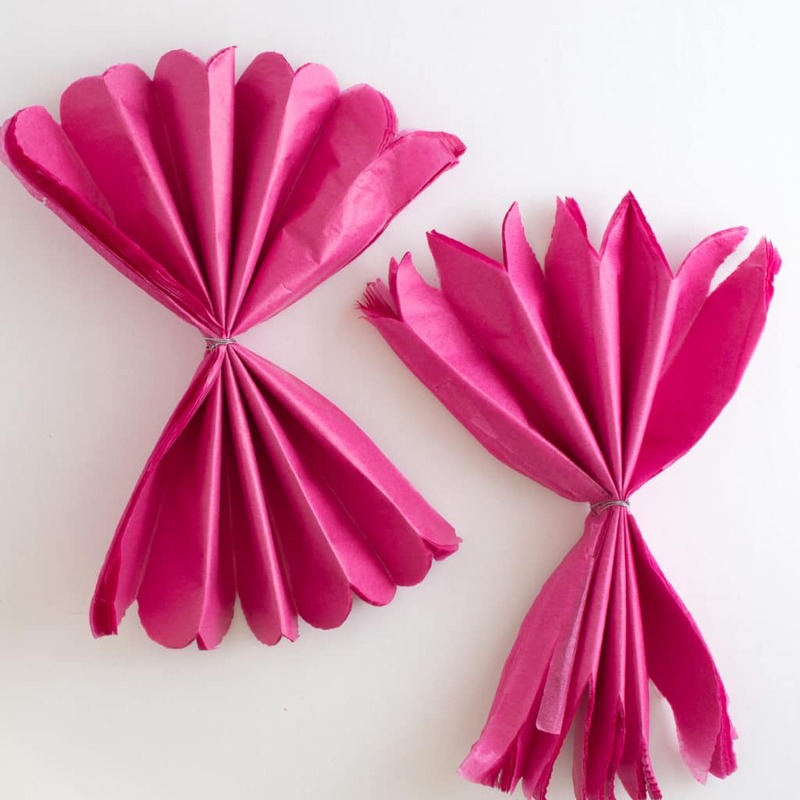 I also tried crepe paper streamers wound around a pom pom maker and LOVED how they turned out. They are so unique looking. They are the perfect paper pom pom if you want something smaller. You can find that tutorial at toward the middle of the post. The last set of instructions is for coffee filter pom poms, which do take a bit more work but have a very unique look about them. The coffee filter pom poms look a bit like lanterns and I feel they have a texture that compliments the fluffy tissue paper flowers nicely. You can find that tutorial toward the end of the post. I love testing methods and recording the results. I have a similar post about the best yarns to use for making different size pom poms. So if pom poms are your thing, you might want to check it out! Oh, and a pom pom rug that’s SUPER cute! It looks like daisies! 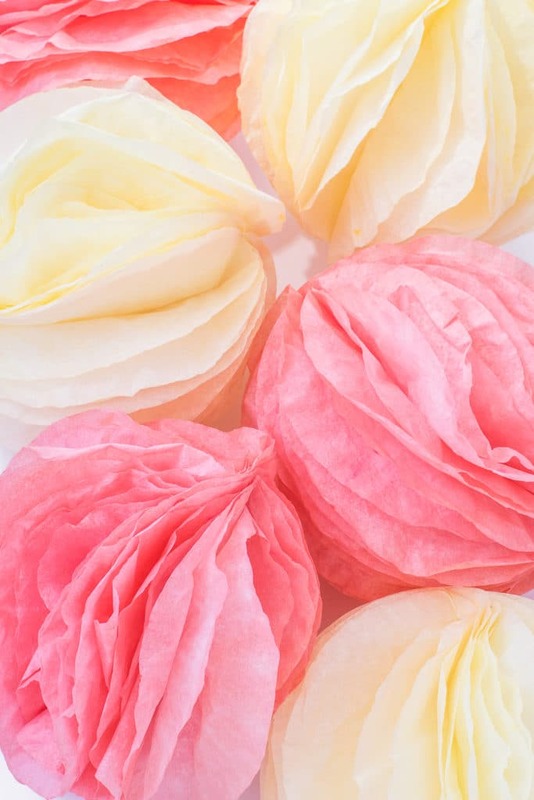 All you need to make tissue paper pom poms are packages of tissue paper and some floral wire. A sharp pair of scissors and wire cutters are the only tools you’ll need. If you don’t have the floral or crafting wire you can tie them off with string. If using string wrap it around a few times to secure well. You need to start with a stack of tissue paper that is square. 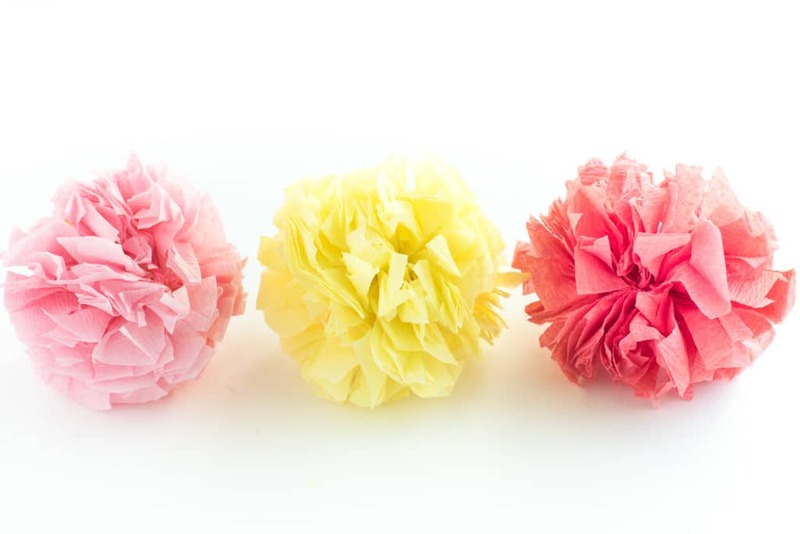 Small paper pom poms require only 10 layers of tissue paper, but the larger the pom-pom, the more layers of tissue paper required. This is where I see other tissue paper pom pom tutorials go off the rails. 10 sheets of tissue paper are not enough for a larger pom pom. Once the size goes beyond 12 inches you need to add more layers. At 12 inches I added 5 more layers, at 18 inches I added 10! The bigger the pom pom, the more layers required. 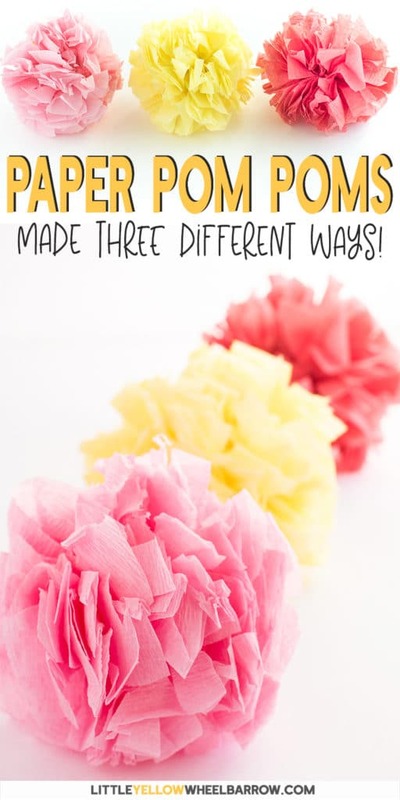 If you make larger pom poms and only use 10 sheets, your tissue paper pom pom will look very weird. They will not look layered or fluffy. 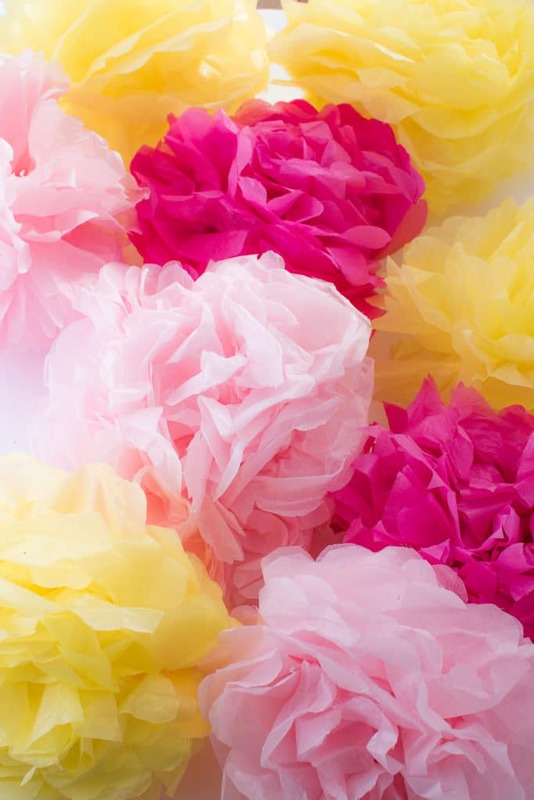 We want these paper pom poms to look like super fluffy layered flowers and the only way to get that look is to make sure your tissue paper is layered very well. 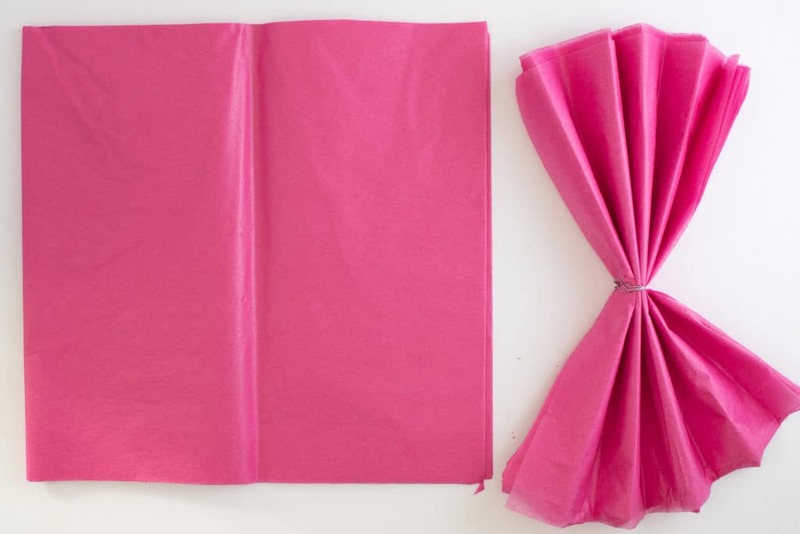 Lay out your square of layered tissue paper and fan fold it all the way across in approx 1-inch increments. don’t worry if this is not perfect, it doesn’t really matter if it’s exactly an inch, you just want to fan fold it all the way across and fasten it in the center ( as shown in the photo above) with your floral wire. You can trim the edges any way you wish. 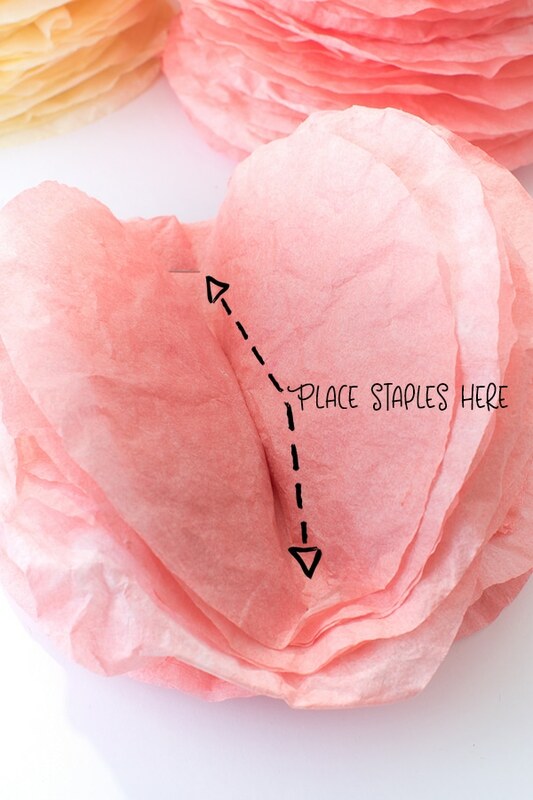 Adding a pattern to the edges really give the tissue paper pom poms a floral look. I experimented, and I liked the scalloped edge the best as they look like big fluffy peonies in the end. But you can try anything! That’s the fun part about these tissue paper pom poms, it’s hard to ruin them! Start separating your layers by gently pulling each layer toward the center. Go slow, the tissue paper tears very easily, so be patient (unlike me! ), keep going layer by layer pulling in toward the center. Do half of the layers toward one side and then flip it over and do the same for the back side. If you tear your tissue paper, don’t worry about it you likely won’t see it at all. If it is very noticeable you can simply snip that ratty piece out. These streamer puffballs are SO much fun to make! 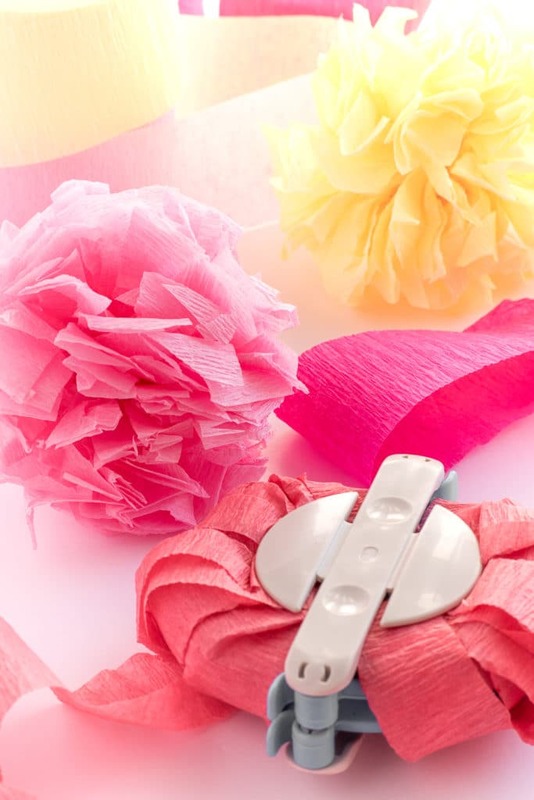 All you need are rolls of streamers and a large pom pom maker, plus a few pieces of string or yarn and a sharp pair of scissors to finish them off. These pom poms are so CUTE, but they are on the smallish side. After trimming they measure 4 inches across. 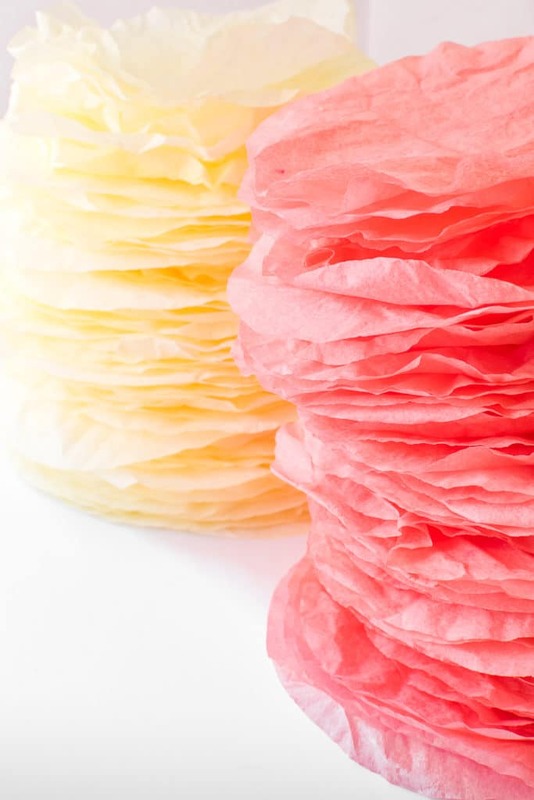 They don’t take very long to make and the crepe paper streamers add a very interesting texture to the paper pom pom. These would make great pom pom flower display if you added some wooden stems and dropped them into a vase or two. Wind your streamers around your pom pom maker until the maker is full. I twisted my streamers around and folded as I wound. It sounds more complicated then it actually is, but I found by twisting I ended up with better-looking pom poms. Once your pom pom maker is full follow the center track and cut all the way through with a sharp pair of scissors. Repeat the same process on the opposite side. Wind a piece of string or yarn through the center of the pom pom maker and tie tightly. Remove your pom pom from the pom pom maker and trim up with a pair of scissors. 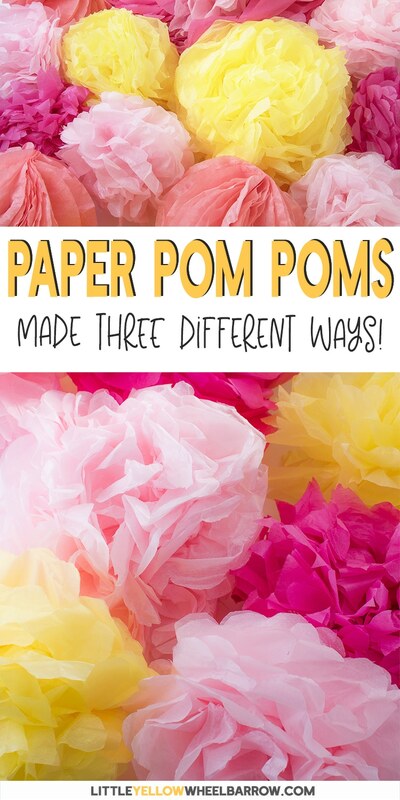 They are so cute and very different from other paper pom poms. The coffee filter paper pom poms take a bit more work but they look so amazing that I made several batches for this event. 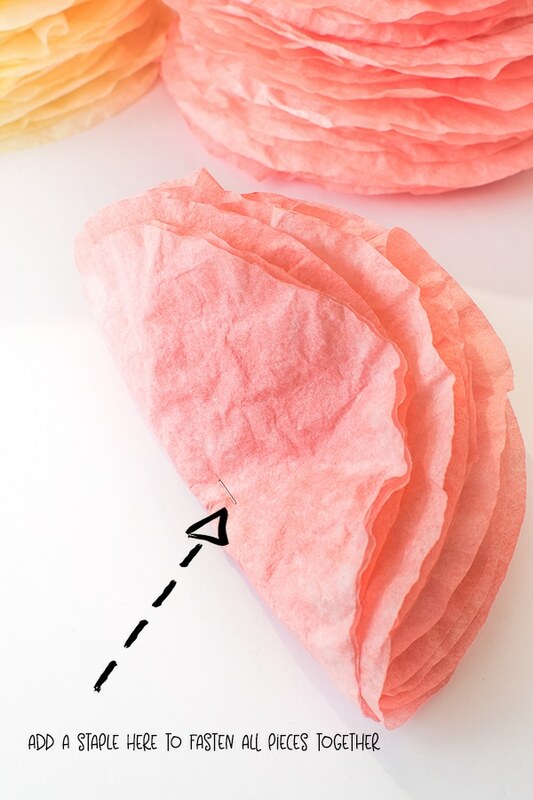 For this method, you need a package of round coffee filters (the cone ones won’t work for this project) and some fabric dye. You only need to use a teeny tiny bit of dye for each package of coffee filters and it takes no time at all to dye them. A quick 10-second dip is all it takes unless you want a more vibrant colour. Use a flat bottom pot, and add in some hot water. It does not need to be boiling, just hot tap water is perfectly fine. Add a tsp of your fabric dye to the pot of water and give it a stir. Dye stacks of around 50 at a time and dip them into the dye bath for about 10 seconds. Leave them longer if you want them darker. When you pull them from the dye bath, let them drip a bit and give them a soft squeeze to get some of the dye out. Let the stacks of dyed coffee filters rest on an old towel for a few minutes to let more of the moisture run off. Once they are no longer dripping wet toss them into a cool dryer for about 20 minutes. Keep an eye on them. To help the drying process along, separate your stacks into four or five groups when you add them to the dryer. Don’t do different colour batches at the same time, stick to one colour (trust me on this). Putting the coffee filters through the dryer creates that ruffled look you can see below in the photo. If you do not want to use your dryer, you can lay them out to dry. Be warned. they will take over your entire house and stain anything they come into contact with until they are dry. When you finish drying your coffee filters, give the inside of your dryer a wipe to make sure no dye remained behind. I did not have any dye when I wiped mine, but better safe than sorry. You could also run a clean wet old towel through the dryer for a bit to see if it picks up any dye. Count out stacks of 10 coffee filters and fold them over. Add a staple to center as shown in the photo. This holds your coffee filters together and creates a half circle. Do this for all your coffee filters. Set up stacks of 10 and staple them in half. Try to keep the staple close to the folded edge, but make sure your staple is going through all the filters. The next step is to take two of your folded sets of ten and attach them together. Take two stacks and flatten them as best you can. Place the stacks back to back, so that the crease is lined up, and you can’t see the staples. Add staples to the top of the stack and the bottom securing the two bundles of coffee filters to each other. All that is left to do is fluff. You may find that you need to add an extra staple here or there, and that’s perfectly fine, you won’t see it so it doesn’t matter. These coffee filter paper pom poms turn out so pretty and ruffly! They look very different vs the tissue paper pom pom decorations not so flowery, more like actual decorations. Kinda like those honeycomb ball decorations that you fold out. Paper Poms Poms Everywhere Everywhere! 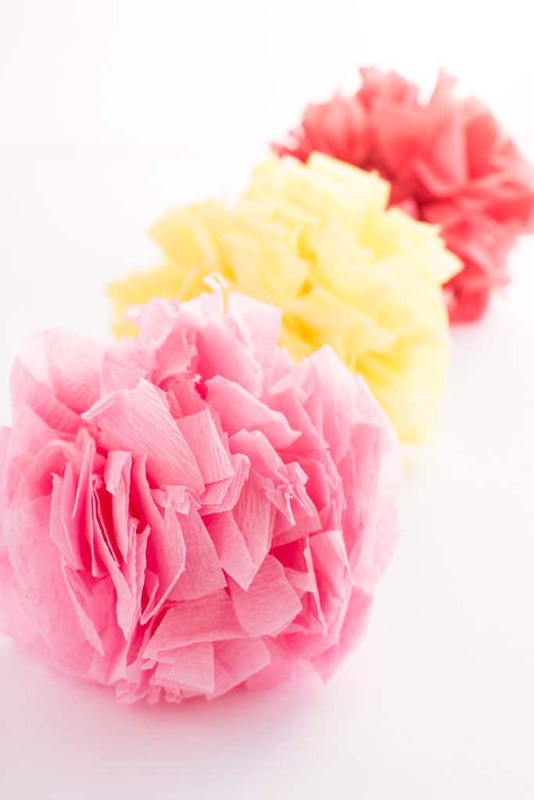 If you have an event where you need to make your own decorations, these paper pom poms are a really easy and inexpensive way to get it done. Depending on the look you’re going for you can fill a wall or a table display quickly. They make such an impact! I tested several methods to make my decorations but these were the three methods that yielded the best results. But if anyone has a suggestion on a better way to make paper pom poms drop a comment and I will be happy to test your method! And if pom poms are your thing (because apparently, they are my thing now), I also have a pom pom heart wreath post you can check out! « Easy Christmas Decorations to Make for your Rustic Holiday Tree.